At Waterloo Dubois commanded the 1st Brigade of the 13th Cavalry Division in Milhaud's IV Cavalry Corps. 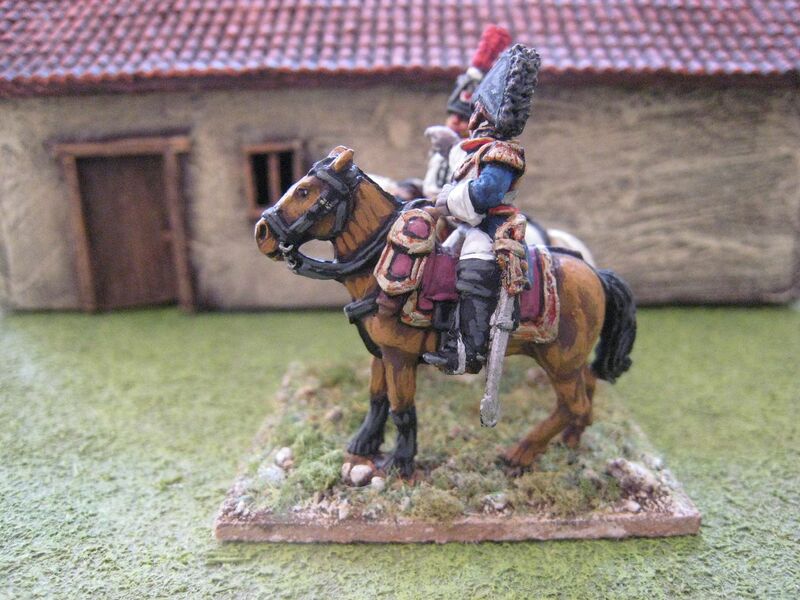 His brigade consisted of the 1st and 4th Regiments of Cuirassiers. 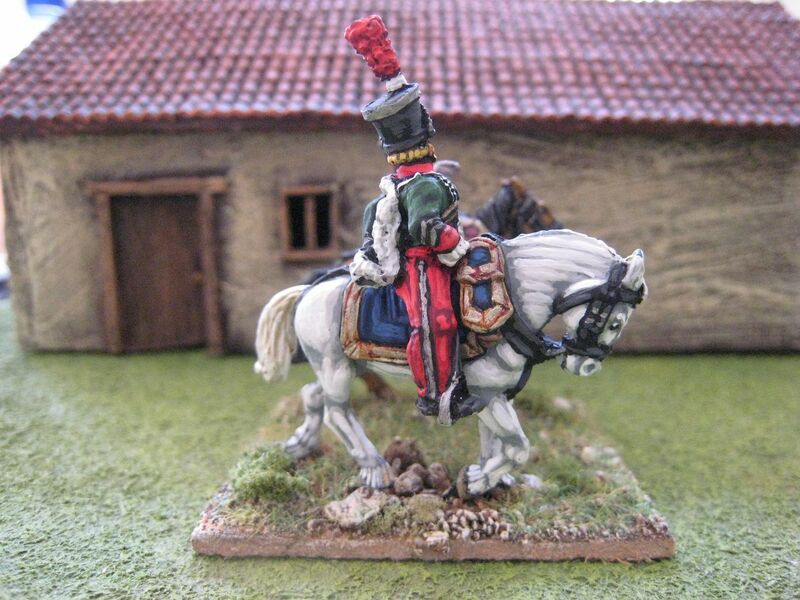 Dubois was a natural choice for inclusion in my flurry of French generals as I painted the 4th Cuirassiers a few years ago, and the 1st Cuirassiers are on my list of things to paint up this year. Jacques-Charles Dubois (1762-1847) joined the dragoons in 1781 but left the service a few years later. He rejoined soon after and by 1792 was lieutenant in the 16th Dragoons. He served in the French Caribbean colony of Sainte-Dominque (modern Hispaniola) and then in the Vendée. Like most French soldiers of his generation, he fought with Napoleon in Italy and then in the Prussian and Polish campaigns. He fought at Eylau, as a major in command of the 5th Dragoons' elite company, and so distinguished himself that he earnt the praise of no less a figure than Murat himself. In 1807 Dubois transferred to the 7th Cuirassiers as their colonel and was appointed a baron of the empire the following year. At the battle of Essling he had to assume command of his regiment's division, as all superior officers had been killed or wounded. In February 1813 he was promoted to général de brigade rank, in recognition of his regiment's performance at the crossing of the Berezina. He seems to have been a brave and inspiring leader. Milhaud's Corps provided support for D'Erlon's large attack on Wellington's centre. Dubois' brigade appears to have been involved in the fighting around La Haye Sainte, initially to assist other cuirassiers who had had some success against Hanoverian infantry but have then been counter-attacked by elements of the Household Brigade. Dubois charged into this melee and may then have also been attached by the Union Brigade as it charged into D'Erlon's infantry. Apparently during this encounter the coloner of the 1st Cuirassiers had his epaulettes ripped off by a captain of the 1st Light Guards. It is not clear whether Dubois' brigade then took part in the later cavalry attacks on the allied centre or was sent to participate in the defence on Napoleon's right against the advancing Prussians. So it seems that we don't know for sure whether Dubois was ordered to charge the allied square with the French cavalry in the late afternoon. 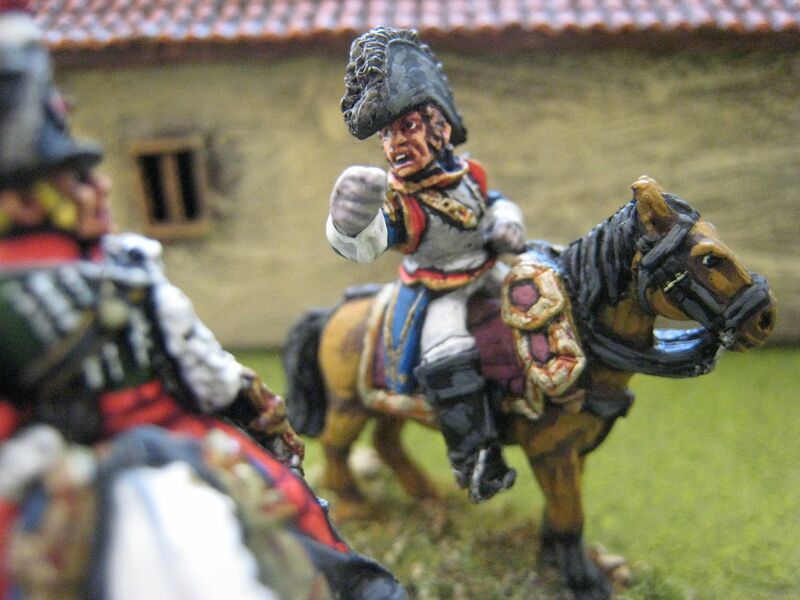 Which is a shame, as the Foundry figure here has a wonderfully angry expression, as if he's saying to his ADC "tell the Général de Division that I'm not throwing my command away by charging British infantry in square". 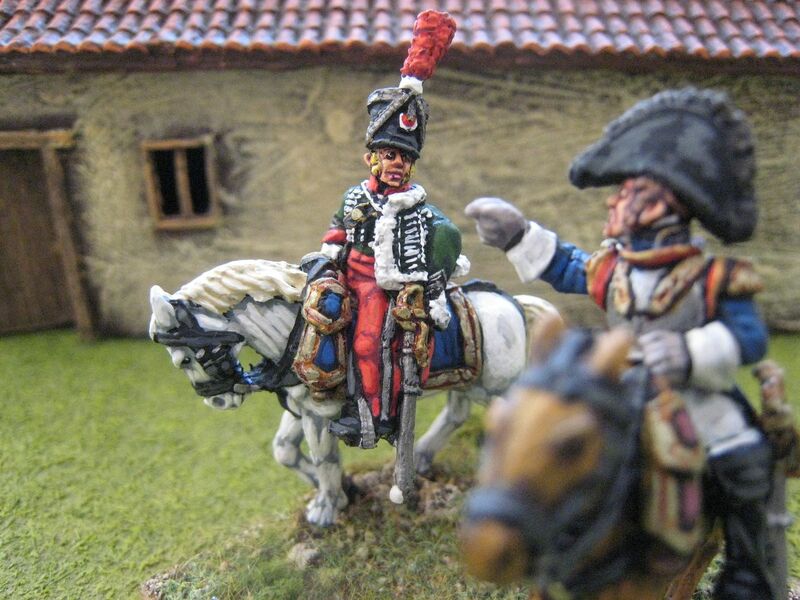 Maybe instead he's asking the ADC to ensure that the 1st Cuirassiers' colonel finds some new epaulettes. 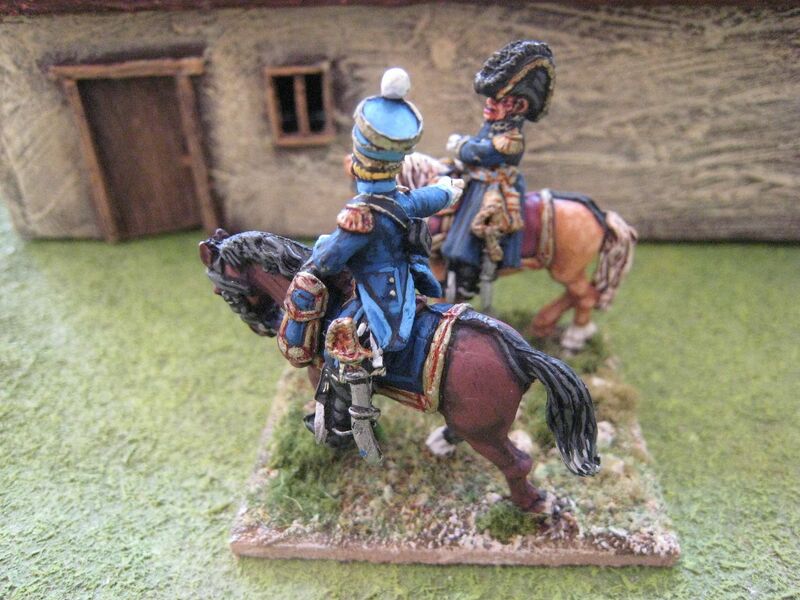 The ADC, also from Foundry, is painted as a junior officer in the 7th Hussars, following a colour scheme in the Histoire et Collections French hussars book that is slightly different to the standard uniform for the 7th (I couldn't see a way of painting this figure in the more usual dark blue with light blue facings ADC uniform). 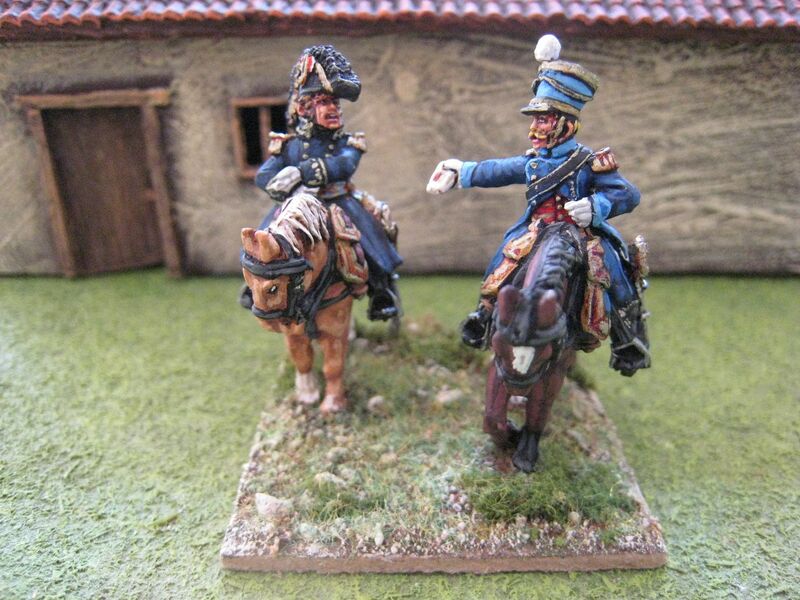 I'm assuming that there is no reason why a heavy cavalry general shouldn't have a light cavalry ADC, and the two figures seemed to go together quite well - Dubois is clearly rather agitated about something. 2 figures. Painted June 2015. Husson commanded the 1st Brigade of the 5th Division in Reille's II Corps. I have all the infantry and artillery elements of Bachelu's 5th Division painted up, and needed command stands for Husson and Bachelu himself to finish it all off (the commander of the 2nd Brigade, Baron Campi, can be found here). He was born on 21 May 1769 and joined the army in 1787. He rose through the ranks, becoming a sergeant in 1791 and a sous-lieutenant the following year. In 1795 he was a captain serving in the Army of Italy and in 1806 became colonel of the 111th Line in 1806. He was made a baron of the empire in January 1808 and promoted to général de brigade rank in August 1811. Husson died on 4 May 1833. He appears to have had an impressive series of battles to his name, having fought in the Egyptian campaign and then at Jena, Eylau, Friedland and Wagram. In 1812, his brigade was part of Macdonald's X Corps and remained in Germany until after the retreat, and at some stage was moved to Danzig. Husson and his troops held the city until the garrison surrendered to the Russians in January 1814. He continued in some "desk jobs" after Waterloo, receiving promotion to général de division in 1826. These figures are both from the Foundry range. There is a noticeable size difference between Foundry and Perry Napoleonic figures and so I'll have to keep them separate. I put these two together because I thought Husson looks as if he's just let go of the reins to reach out for the ADC's despatch. I like the faces on these earlier Perry-sculpted figures. They are slightly more caricatured when compared with the smoother feature of later Perry Miniatures sculpts, but that style provides some excellent expressions. 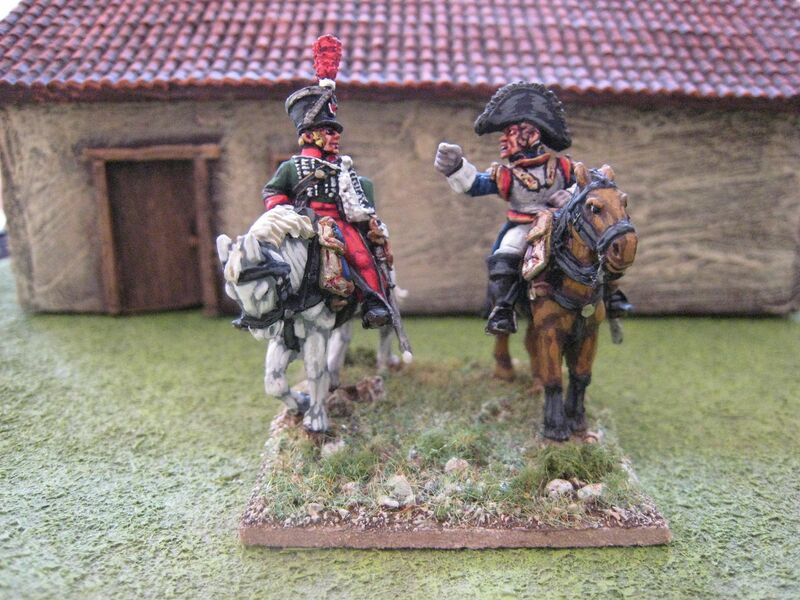 When I finished this command stand I hadn't worked out that Hussons had just turned 46 at Waterloo, so making him one of the oldest brigade commanders. I might add a touch of grey hair this evening. This command stand has been on the "to do" list for literally years, given that I painted the last infantry battalion in the brigade at the end of 2011. When I've based the Bachelu command stand I must take some photos of the completed division. 2 figures. Painted July 2015. I've fallen behind a bit, I'm afraid - real life, holidays, work etc; the usual excuses. This photo of what's coming off my painting desk shows what I've been up to and why there's been a lull in posts. 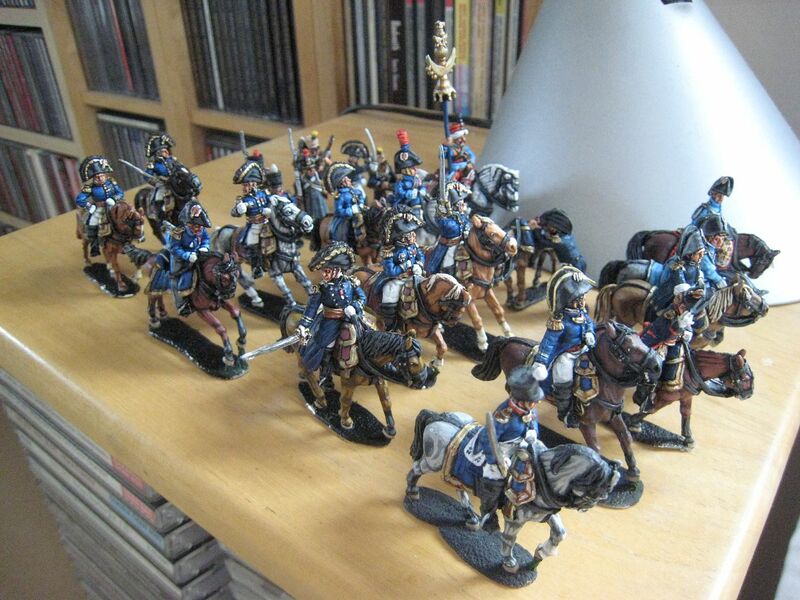 My nod to the Waterloo bicentenary has been to work through my 1815 French lead pile and, in particular, to concentrate on painting up higher command stands for my current French army. I needed one more brigade commander and a divisional command stand to finish off Bachelu's division from Reille's II Corps. I already had figures for those, but I thought why not add Reille himself? And if I'm going to buy the Perry corps commander's pack, why not paint d'Erlon as well given that his corps is what I'm looking at next, having already made a start on the 1st Division of I Corps. Lurking in the leadpile were various ADC and staff figures that I bought years ago for the Salute game but never painted. So for the past few weeks I've been painting lots of Perry personality figures and other bits and pieces from a variety of sculptors (including a Mameluke band from Gringos40 - that should be finished in a couple of weeks). I've already based a couple of command standss using Foundry figures - I'm hoping to photograph those either today or tomorrow. But all the stuff on the photo above is sitting in the "departure lounge" next to my painting desk until I finish everything else, as that's when I will decide how the figures will fit together. There will be two corps command stands, four division stands and a couple of brigade stands. And the Mameluke band - every self-respecting Waterloo collection should have one!